When you live alone, you can do whatever you want, whenever you want. For instance, you have complete 24/7 control of the remote. You always get to eat the last piece of cake. And you can decorate your bathroom red – which I did. My friends who are married are limited when it comes to home decor. They paint their walls “mushroom” and choose stripes and solids for drapes and upholstery. I can use colors and patterns no man would ever agree to have in his home. I inherited a kitschy 1970’s styled bathroom when I bought my condo. Picture a man cave. Now picture the polar opposite. The tub, toilet, sink, and even the floor tiles – pink. Calamine lotion pink. But since the fixtures were in such good condition, instead of gutting the whole thing, I decided to keep the pink. Remember the number one rule of living alone: you can do whatever you want. That’s when those iconic red poppies came to mind. 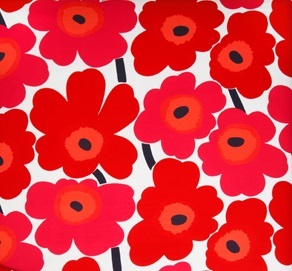 “This is either going to be the most brilliant thing I’ve ever done,” I confided to the Marimekko salesgirl, “or else it’s gonna clash so badly that it’ll make me dizzy.” She assured me I could return all of it: the shower curtain, the matching storage tins, the accent towels, if I passed out. Once I knew I was on to something, I bought an armful of solid red towels and a lipstick-colored soap dish, tissue box, and waste basket set. In the end, the pink ran and hid under all that red. As a single woman home owner, I took on a big responsibility. But with that responsibility came great freedom. Recently, I looked with new eyes at the kitchen counter tops I also inherited. Then I took a trip to that big home improvement store just to look around.